There’s a new game in the little blue Mazda. It’s revolutionizing my outlook, starting conversations I would have missed, and making me laugh at how much Lennon scowls under the pressure. I want to be with Him. In His gates. In His courts. In His lap. Thanksgiving is the key. The first thing. Always. I don’t want to be the girl who stands across the street shouting, hoping He hears me and that magic wand sprinkles a miracle in my direction. I want to be sitting at the feet, curled up on the lap, bouncing on the shoulders of My Father – His hand consuming mine, His eyes locked in mine – talking Family talk. We enter his gates with thanksgiving and his courts with praise. We enter his hands and his lap through Adoption, paid for by Jesus and sealed by the Spirit. So we start with just Three Things. Three things we are thankful for right then and there, safely belted into the little blue Mazda. Yesterday I went on three car rides. 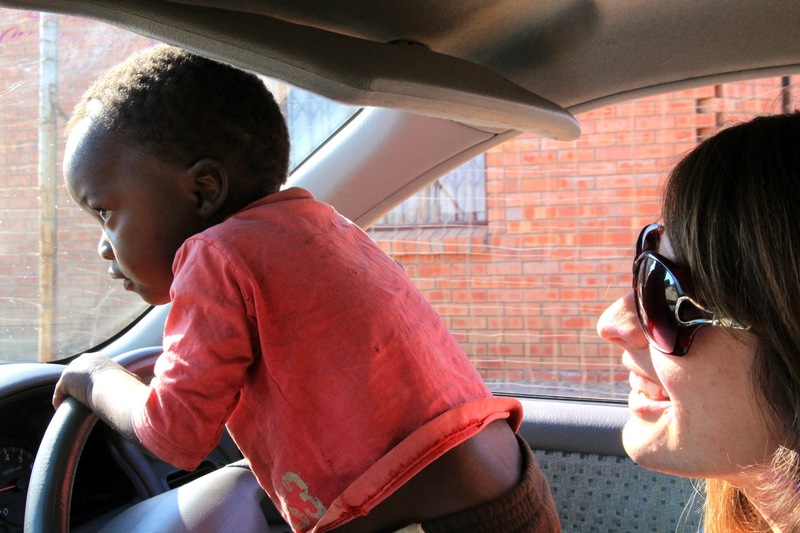 First, Lindsay and I went to pick up a donation from a local South African who decided to use her own time, her own money, and to break everyday’s routine to respond with true religion (James 1:27). 1. I am thankful for chicken, pap and juice - and for the hungry mouths that will be filled this week. 2. I am thankful for people responding to people in their own neighborhoods. 3. I am thankful for the ways Jesus surprises me through giving. Then, Laura, Lindsay and I went to Dwaleni to find Nandi – who hasn’t been home since Saturday night. We couldn’t find any mamas, but the kids came out of nowhere at the sight of the little blue Mazda. One 2-year old face in the rear view mirror, and another’s little legs running with a smile. Then Nandi appeared, head-in-hands to hide her relieved smile. Then 5-year old Tommy and 4-year old Charity playing with another group of kids. I had no idea what to do with all these little longing, smiling faces. There were no mamas around to give them attention, but they felt like celebrities when the Mazda pulled up full of kisses and laps. 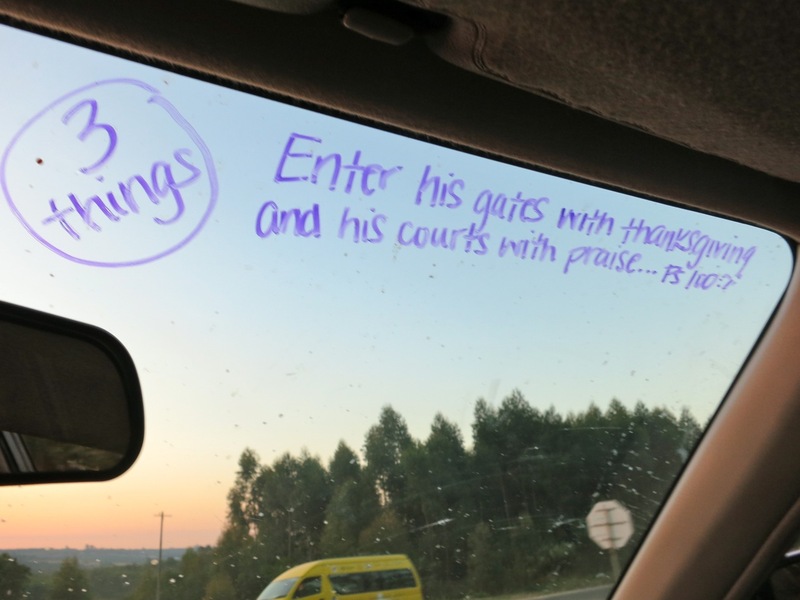 I’m not kidding… Ten kids in the car, white-girl Jesus rap music blaring, and car-dancing as we drove a circle around Dwaleni… just because we could. 1. I am thankful for all those smiles and giggles. 2. I am thankful for the little blue Mazda and the ability to provide 3 minutes of bliss. 3. I am thankful for Laura Chaffin providing the soundtrack. We took Nandi and Tommy to my house. They were lethargic from hunger and filthy from inattention. They played and played and played, and ate and ate and ate. They had bubble baths and dressed up in mine and Lifa’s warm clothes. Long-legged, 11-year old Nandi loves the idea of running water and showers, but this time she wanted to be a kid… and take a bubble bath. In a bath bucket that she had to curl half her body into at a time - but it was worth it. As I chopped green beans in the kitchen, her folded up, bubbly body sang “Hallelujah Jesus!! !” while playing with Lifa’s bath tub toys. Finally, sleepy and satisfied, it was time to load up Nandi and Tommy to go back to Dwaleni – plus Lennon, Laura, Lindsay and Rae. As we pulled up, Mama Nandi walked up and grasped Nandi’s hand. In SiSwati, she said she would hold Nandi so she doesn’t run away and made empty promises that she wouldn’t beat her. Nandi grabbed my hand, clutching, squeezing, begging. She looked at me crying, big, desperate tears. “No, no, nooo, Mama Kacy, noooo,” in a voice loud enough for only me to hear. I asked if she could sleep at my house – the grip wasn’t getting any looser. Her mom said no. So I had to let go. All I could do was hug her, kiss her, and say, “I’m sorry Nandi” through everybody’s tears. So we prayed together on the solemn car ride back. And then we played The Thankful Game – even though we had to choke it out at first. 1. Thank You for being more just and more sovereign than I am - for loving Nandi and Tommy bigger and better than I do. 2. Thank You that light casts out darkness, and that Your Name IS Light. 3. Thank You that You are building a relationship with Mama Nandi. That, somehow, in that interaction, she was affected by Light. Every car ride is different. We always approach Him, stand before His sovereign power and glory the same way. Three Things at a Time. 1. I am thankful that the thanks get bigger when the moments get harder - that Your glory does too. That Your strength and radiance responds directly to our need for it and belief in it. 2. I am thankful that not three things nor a million things could capture even one side of Your face, not the smallest measure of Your grace. 3. I am thankful that You invite me into You with each, "Thank you," and that You hear and respond to my whole heart. Kacy, you do not know me, but I am a friend of Laura Uechi. She sent me to the direction of your blog and I can't say I have heard a more passionate person than you. I encourage you to keep moving and believing that God will provide. Keep abiding! I know God has a lot in store for the village.